Every child has a story. Little Steps is a scrapbook compilation of these stories, accompanied by words of comfort, hope and advice from bereaved parents to help and support other parents whose child has died. 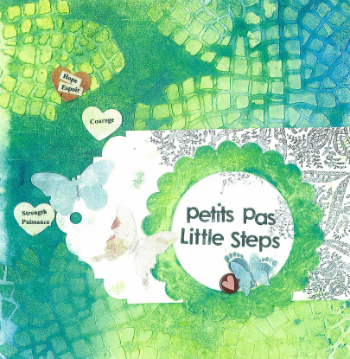 Written and created by a group of mothers whose children were treated and cared for at the Montreal Children’s Hospital, Little Steps is a true labour of love. Developed under the leadership of psycologist Dr. Linda Moxley-Haegert, this collective project was put it into action with the help of Marie-Claude Proulx, Clinical Nurse Specialist. The goal was to unite parents living with the death of a child to allow them to share their experiences and create tools to help other parents living the same experience. The first project of its kind, it includes contributions from nine parents, as well as several siblings. Through words, photos and illustrations, these mothers, fathers and siblings shared their feelings of sorrow, anger, frustration, and emptiness, but the book also highlights memories and has thoughtful suggestions to support other parents dealing with grief and loss. The result is a beautiful book filled with love and compassion.